Palms @ Sixth Avenue is located at 245 Sixth Avenue Singapore 275773, in Singapore District 10 Bukit Timah enclave. A place for all your pleasures, a place for your retreat. The distinguished district of Bukit Timah is your home sweet home, Holland village and Orchard is your playground with all the dining and shopping options. Nearby renowned schools include Nanyang Primary, Raffles Girls Primary, Henry Park Primary, Hwa Chong Institution, Ngee Ann Polytechnic and many more. 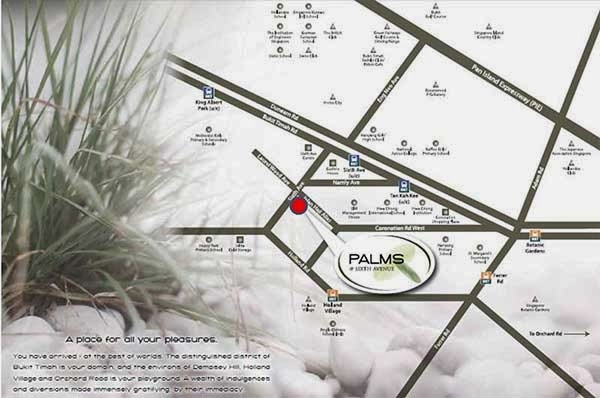 Palms @ Sixth Avenue is well accessible via MRT. Nearest MRT is Sixth Avenue MRT and Holland Village MRT which links to you all parts of Singapore in a breeze.